PhotosByMarbles | Your Love. Your Story. We’ve been tasked with a little project for November and we’re looking for all you couples who are deep in love to please come help us out! Details of our project have to be a little mysterious for now but we are looking forward to the completion of our project, when we get to share what we always aim to do, showcase the love of our couples and the stories that they carry with them. will get our full Goli Experience plus some very special captures for their engagement or pre-wedding memories. That and that there are a very limited number of slots we have available that will allow us to work with you for free. Have a couple picture you’d like us to see? We look forward to learning more about you couples & how you would fit perfectly with our project! Apart from this blog, our Facebook page, Pinterest (more on that next time) and our (sometimes neglected) main website, we are also on Instagram! We’re slowly but steadily filling it up with many of our favourites from our most recent shoots and also a handful from our archives. we also have 2 new tags! #pbmstories & #pbmmoments ! #pbmstories is where we let you in on the little stories that our photos carry, bringing you the memories of our couples (& sometimes even our journey with them), a glimpse into their love and ultimately, each of their unique stories. #pbmmoments will lead you a collection of amazing moments captured at our shoots, whether it’s tears of a parent, the secret look of love of a new husband, a friend finally seeing the love of their friends realised or a mother’s look of adoration cast upon her child. Once in a while, we might feature some images we love from other great sources through a #repost. These will be posts that have either really inspired us and we know will inspire you too, or are just so spectacular that we want you to add it to your inspiration lists or mood boards as you plan for your for your very own wedding, or shoot with us. So we’ll see you in Instagram! p.s. let us know if you have more ideas on what new tags we can use! Posted in Wedding Day	| Tagged goliexperience, photosbymarbles, Singapore, Wedding	| Enter your password to view comments. So we started with a website. Then we had our blog (which has gone through quiet a few “re-births”). Then we started our Facebook page (which seems so easy but compounded by so much that’s so silly). and now, we’re on Twenty20 too! It’s a week before Valentine’s Day! And we’re sharing with you a fantastic treat that we have with the great people at Streets of London at British Hainan! 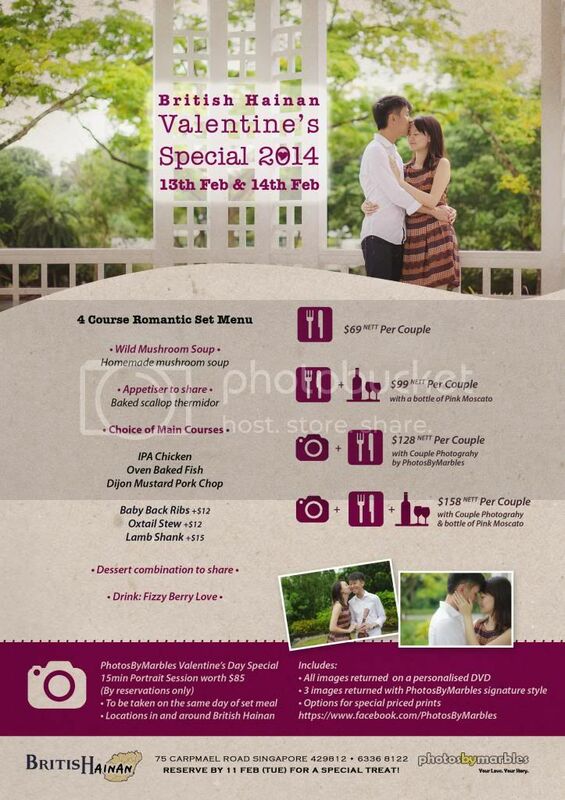 They have a special meal planned for all you lovebirds at a great price. You can then add on fabulous options to your meal like their special mains, wine and even a mini session from us! So that’s where we (Marbles!) come in! You can opt to have a mini session with us in their pretty little shop and around their quaint little neighbourhood before your meal to have some of your Valentine’s Day moments captured for you to share for years to come. It’s a really great deal that you will get, both in terms of food & photography! So give them a call ASAP to make a reservation and remember to tell them that you want a mini session with us! You might also want to drop by their Facebook page and tell them on their V-Day post, what would make your V-Day perfect. I heard that they (Oh… we!) are giving away a food + photography package to someone with a great comment! Now fear not if you have already planned your V-Day dinner. If you too would like to have a mini session with us to celebrate this Valentine’s with your valentine, drop us an email at AskGoli@photosbymarbles.com and let’s arrange something special for you!